Electricity meters produce EMFs. The size of field they produce depends on the design. Traditional meters with a rotating disc produce fields much like other appliances. Digital meters, and new Smart Meters, produce much lower power-frequency fields, but smart meters produce radiofrequency EMFs as well. A traditional UK analogue meter with a rotating disc. This uses magnetic fields to drive the disc round so not surprisingly produces external magnetic fields, which are comparable to those from other domestic appliances. See further details on the size of the field, how it varies with current, how it falls with distance etc. 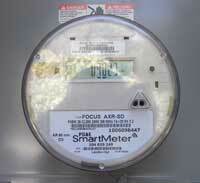 A new Smart Meter (this example is from the USA). These produce lower power-frequency EMFs than traditional meters. But they also produce radio-frequency (RF) EMFs from the wireless signals they use to communicate and transmit data. See further details of these RF EMFs.